HUD USER offers a selection of our most popular housing research in a variety of eBook-friendly formats. We invite you to browse our inventory and download titles of interest. New titles will be added on an ongoing basis, so be sure to check back often for new releases. For assistance, please see the Help section or email us at helpdesk@huduser.gov. The goal of Cityscape is to bring high-quality original research on housing and community development issues to scholars, government officials, and practitioners. Cityscape is open to all relevant disciplines, including architecture, consumer research, demography, economics, engineering, ethnography, finance, geography, law, planning, political science, public policy, regional science, sociology, statistics, and urban studies. 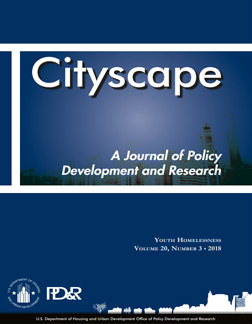 Cityscape is published three times a year by the Office of Policy Development and Research (PD&R) of the U.S. Department of Housing and Urban Development. Congress and many researchers and practitioners in the field of housing counseling have asked whether pre-purchase homeownership counseling for first-time borrowers leads to better borrower outcomes and reduced lender risk relative to no counseling. HUD designed The First-Time Homebuyer Education and Counseling Demonstration as a large-scale randomized experiment to answer the question about the relative efficacy of homebuyer education and counseling on first-time borrowers. Because of the richness of the data collected on study participants at baseline and during the service participation period of the Demonstration, a detailed analysis of the study participants’ personal characteristics that are associated with program participation in – both initiation and completion of – in-person and remote homebuyer education and counseling services was possible. 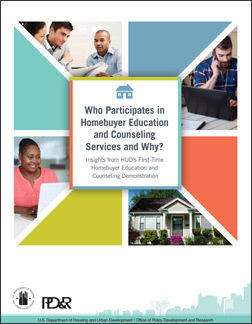 Key findings from Who Participates in Homebuyer Education and Counseling Services and Why? Insights from HUD’s First-Time Homebuyer Education and Counseling Demonstration indicate that women and homebuyers with greater education were more likely to participate in homebuyer education and counseling services in general. Those at an early stage of the homebuying process, those who reported being “pretty good at math,” or those who planned to purchase a home without a co-borrower were more likely to participate in in-person services. Those who planned to spend more years living in their purchased home, who scored better on a baseline mortgage literacy quiz, or who had a higher credit score were more likely to participate in remote services. 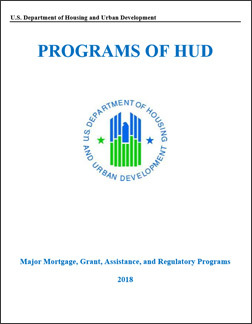 This paper provides data that can inform how HUD’s Housing Counseling Program and service providers market and deliver homebuyer education and counseling services, and serves as a useful basis for readers to assess the ultimate findings of the Demonstration that will be forthcoming in future reports. 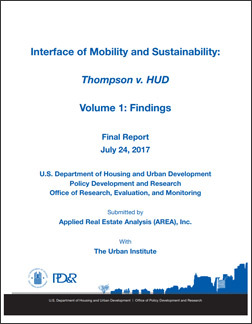 This study satisfied the 6 research objectives specified in the Final Settlement Agreement from Thompson v. HUD, a landmark public housing segregation lawsuit. Inadditon to the six objectives that guided this research, the Settlement Agreement provided for housing choice vouchers (HCV) for the plaintiff class (African American public housing residents) to move to “opportunity” communities. The lead article, "Housing Assistance, Employment, and Self-Sufficiency," discusses the barriers that can keep HUD-assisted households and individuals experiencing homelessness from achieving self-sufficiency; profiles programs administered by HUD, public housing agencies, and other stakeholders to help overcome those barriers; and surveys research findings on the effectiveness of such programs. The Research Spotlight, "Jobs Plus: Self-Sufficiency in Public Housing," by Brian Stromberg, discusses the evolution and evaluations of HUD's Jobs Plus program, which has successfully increased earnings of participating assisted residents. 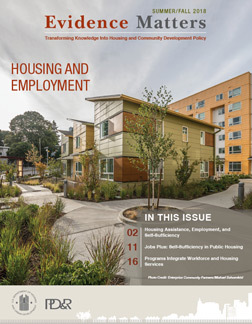 Finally, the In Practice article, "Programs Integrate Workforce and Housing Services," discusses initiatives in Chicago and King County, Washington, that have helped participants improve basic skills and access job training and stable housing. 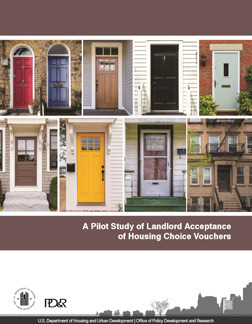 This pilot study uses rigorous paired testing methodology to explore landlord treatment of Housing Choice Voucher (HCV) holders during the initial stages of the housing search process. It is the first study to use paired testing methods across multiple sites to examine landlord treatment of HCV holders. The study finds that landlords often refuse to rent to HCV holders. In most cases, the landlord refusal takes place early in the search process, when a tester calls the landlord and asks whether Housing Choice Vouchers are accepted. In other cases, the landlord may suggest that vouchers are accepted, but subsequently fail to show up for a scheduled appointment. Landlord denial rates vary across the five study sites and may be influenced by factors such as state or local laws that prohibit discrimination by source of income (particularly local source of income laws that include protections for Section 8/voucher holders), housing market conditions, and voucher payment standards. Initially funded with $10 million from HUD, the NRN provided direct technical assistance (TA) through five organizations: Enterprise Community Partners (lead organization); Public Financial Management, Inc. (PFM); HR&A Advisors; the International City County Management Association (ICMA); and the NYU Robert F. Wagner School of Public Services. Generally, the quality of the TA delivered was high and well-received in the target communities. However, the evaluation's overall assessment of the effectiveness of the program is inconclusive. The evaluation was unable to determine whether the TA was successful in addressing the overarching goal of the NRN - to "provide the most distressed US cities with the capacity to address their own underlying economic and fiscal plight in a workable manner." 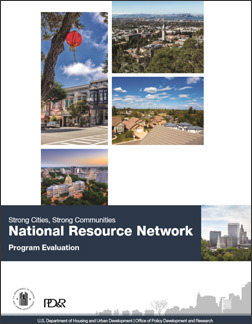 NRN TA engagements were viewed as a success and local representative indicated they thought their city would not have been able to accomplish the same tasks without the NRN assistance. In some cases, respondents indicated the outcomes of these engagement will take a long time to be apparent, and some sites expressed concerns about the sustainability of these changes due to issues with capacity and priority setting in their community. 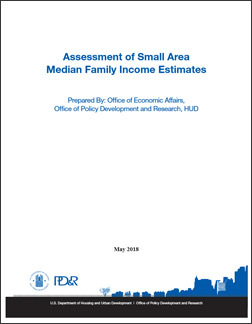 The Senate Committee report accompanying the 2018 appropriations act expresses concerns about the accuracy of FMRs, particularly in areas where rents "have risen quickly." The report directs HUD to submit a report to the House and Senate Committees on Appropriations "describing proposals to update the FMR formula to more accurately reflect the current housing market." This report recounts the manner in which FMRs are calculated and discusses measures of the accuracy of FMRs. Within the report, HUD breaks the FMR calculation into 3 components and describes the potential sources of inaccuracy for each component along with possible remedies. The 3 components are the FMR trend factor, the inflation-based update factor, and the base rent data from the American Community Survey. This study investigates the role of landlords in low-rent housing markets in Baltimore, Cleveland, and Dallas and the role landlords play in shaping the residential experience of low- and moderate-income renters, especially households in the Housing Choice Voucher (HCV) Program. The study is based on interviews and observations of a sample of 127 landlords and property managers, seventy-three percent of whom accept housing choice vouchers. 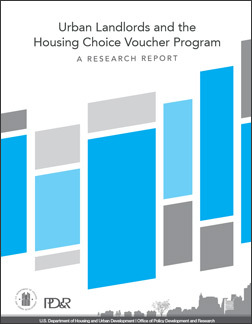 The report shows how local rental markets influence landlords' interest to participate in the HCV program, including: (1) financial motivations (reliable payments); (2) attitudes about housing voucher tenants; and (3) interactions with the public housing authority (PHA). Among landlords who chose not to participate in the HCV program, the primary reasons stated were negative experiences with the program itself, including frustration with the inspection process, general bureaucracy, and disappointment when the PHA did not take the landlord's side in conflicts between landlord and tenant. The study suggests there are opportunities to recruit landlords into the HCV program by focusing on the things that matter most to them-reliable rent payments and tenants who stay a while, help care for the property, and do not cause damage. The ConnectHome initiative is a collaboration between communities, the private sector, and the Federal Government to expand high-speed internet access, technical training, digital literacy programs, and electronic devices to low income households living in HUD Public Housing units. ConnectHome launched at Public Housing Authorities (PHAs) in 28 communities covering a wide range of urban, rural, and tribal land. 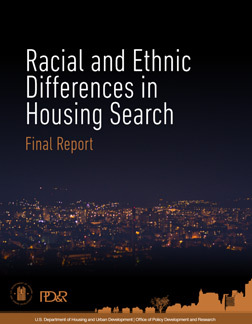 HUD partnered with an external research team, Insight Policy Research to evaluate ConnectHome. The report includes: A baseline access survey to measure internet access in the home, devices used, and reasons for lack of internet access; a telephone-based internet use survey of recent ConnectHome subscribers to assess how public housing residents use the internet at home; and case studies of five sites based on interviews and focus groups to understand how sites approach implementation of the program, address challenges, and understand outcomes. Congress asked the U.S. Department of Housing and Urban Development (HUD) to examine the effects of rapidly rising rents in urban areas across the nation and ways to avoid displacement. This report reviews the recent research on the causes and consequences of gentrification and identifies key steps policymakers can take to foster neighborhood change that is both inclusive and equitable. Approaches vary, but share a focus on the preservation and production of affordable housing and collaboration and partnership among local governments. This report suggests four key strategies that could address displacement of lower-income families and long-time residents in urban areas and alleviate the pressures of gentrification on housing affordability and community stability.